Strawberry Swing and other things: [Crafty Lady] Cute as a Cupcake! This weekend I'm attending a baby shower for one of my close friends. She's doing the cupcake theme in the baby's nursery and the shower invitations were also cupcake theme (I imagine the shower will also be).... I was debating for a while what to get her as a gift. You see, I'm a big fan of registries. I'm very practical person and prefer practical gifts. For my bridal shower, I was much happier to receive gifts that I registered for (because we needed them) instead of another margarita set (already owned one) or a pretty decorative bowl (that matches nothing in my home).... Don't get me wrong, I'm very grateful for the gift givers generosity, but I've always played the practical side when it comes to gift giving instead of trying to guess or wing it. At the same time, I always feel like my gifts are missing a personal touch if its just a big box item that the person has "requested". So I usually try to find a way to make it personal. 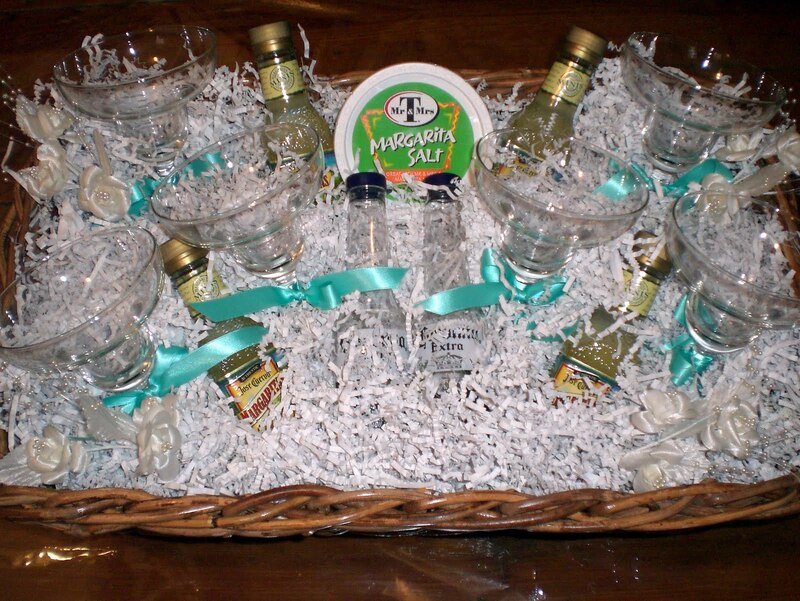 I once gave a friend her registered glassware for her bridal shower. 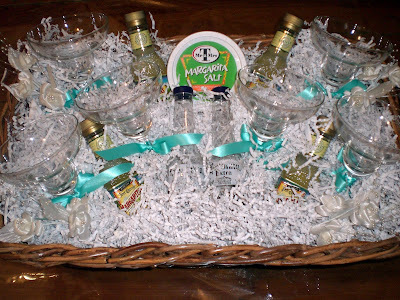 I boxed up all the drinking glasses, but made a margarita themed basket with the margarita glasses, adding in rock salt, Corona salt and pepper shakers, and of course something to fill those glasses with! Last year, I got a girlfriend her Pyrex baking dishes from the registry and threw in some Barefoot Contessa Brownie mix (yum!) and a measuring cup. Trying to do the same thing this time, I was having trouble picking out something to go with a Jumparoo or a Bumbo seat... so I decided instead to make a gift basket with all the little things that would probably be overlooked by others shopping the registry, but were still things my friend would have to purchase because they are necessities - binkies, teethers, sippy cups, wipes, q-tips, and safety outlet plugs. I also picked up a Sleep Sheep at Pottery Barn Kids, because I've heard raves from other new moms. Of course, I had to add the cupcake themed boppy cover and a onesie from BabyGap that has a cute little Boston or Frenchie on it - my friend also has a Boston... I almost wanted to get one for myself to stockpile away for who knows when, it's just so cute! I then took an attempt at some onesie cupcakes. I saw this cute photo on pinterest a little while back and wanted to to try to recreate it. I found the blog entry (here) and a youtube tutorial (here) and tried to make my own. Instead of the coffee filter "cupcake liner" I used tissue paper. I just accordion folded it to get the similar look. I also used a 4 set of onesies (all cupcake themed) to make the cupcakes, instead of receiving blankets. 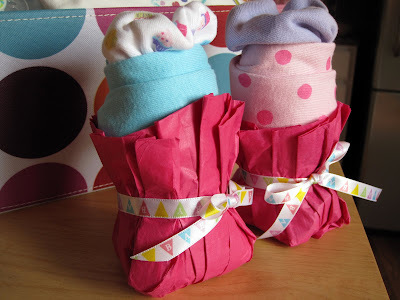 I don't think they came out as cute as the ones you can purchase online (mine are soo tall, LOL), but they are definitely a cute little personal touch amongst the daily baby care products. And hey, when nestled in amongst the other goodies, you can't really see the abnormal base, hehe. What kind of gifts do you like to give at showers? Something thoughtful and unexpected? Registry items? Gift Cards?? I try to do a combination of both registry and personal-touch gifts. 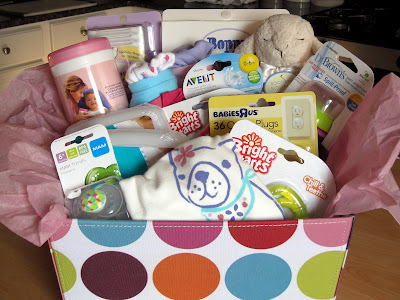 I actually just recently did something similar to what you did here -- for my cousin I got her the bottle liners she had registered for, and beefed up the basket by adding teethers, pacifiers, an outfit or two (honestly I dont even remember what other small goodies I packed in there) plus a handmade blanket. But I totally agree with you -- I do like to give something practical. And sometimes those little things get overlooked when they really are necessary! omg so cute!! Bookmarking these ideas in my baby shower file! Oh so cute, I love how much thought and effort you put on these gifts. I usually just go with the registry, but for my mother-to-be friends, I also crochet a blanket. aww I wish I could do something super personal like knit or crochet a blanket - that's so sweet of you Heather and Rosa! Amber - you on pinterest? ?